"...question your self with a guileless heart again and again... and the truth will unfold that knowledge to you... and you will cross the ocean of ignorance on a raft of knowledge." I have been contemplating of the gypsy life, the nomadic life, the life of wandering, exploring, discovering. The function of journey is mythic in both the personal realm and in the collective. Yet taking a journey differs from the nomadic lifestyle. The first may be seen as a rite of passage, through which one passes and returns, often changed. It embodies transition. The other journey, as lifestyle, is another matter altogether. It is a path. A Way. We orient our existence differently; the transit through this world becomes more of a spiral than an orbit. Everything is new, and although we come round to what appears to be the same, we are now in a very different space and our perspective has changed dramatically. We see what was once familiar, anew; and the new is welcomed as an old friend into our lives. I don't want to be a foreigner anywhere. I wish to be more like a bird or a whale without boundaries -- at home beneath any sky, in any water-- for in truth it is one big sky and one big water. Of course, I recognize the reality of nations and their corresponding laws, still I wish to learn to embody the essence of living without these boundaries. And I am trying to actualize this. Enter Nomadness, boundary defiant and sea worthy. 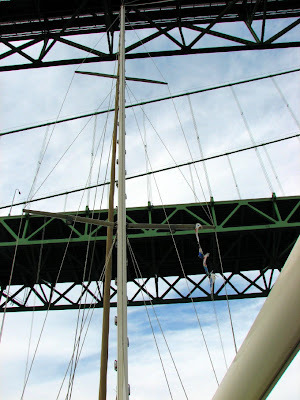 On a sailboat every bridge looks like a disaster, but we continue on with faith, gliding forward into the future. We come to recognize that what appeared to be an obstacle was but an illusion manufactured from our limited perspective. Every sailor knows this feeling, we have the facts, yes we can go forth, and yet we tremble slightly each and every time before what appears impossible. My partner, Steve Roberts, who is expert at actualizing the impossible, has written about his "epic bike trip" in Computing Across America. He saw the journey as an opportunity to merge all his passions into one lifestyle. What a great idea! We should all do it, right? Easier said than done for sure. The first step in this direction is the presence of mind and sincerity of heart to honestly ask and the answer the question: What are my passions? "... a self-sufficient technomadic community that has reached a critical mass of skills and tools, and is thus able to respond to changing world situations (or pure whim) by relocating on a global scale." I would only add to this the vital need for expression. I want to invite and inspire creative artistic expression. I want to "make something" of the experiences we share. What this "something" becomes, will be determined entirely by the individuals who people this community. This doesn't mean one has to have an artist's resume to contribute; we are all creative whether we have honored and acted on it in the past or not. What is important is the willingness to express oneself, to bare the truth, and to bear witness. To take the impressions of a nomadic life and excrete something potent, beautiful and inspiring. I envision a gypsy-spirited flotilla of information junkies, sailors, songsters, survivalists, geeks and goofballs putting our heads together to make something new. I want a community that travels and creates together, pooling skills and moving toward self sufficiency and the seasteading lifestyle. We have an opportunity to create something that both expresses and demonstrates the freedom of nomadism. We can do more than write or perform about freedom and adventure; we can live it. We can experience it. With experience comes knowledge and understanding, the raft upon which we will cross oceans of ignorance and fear both within ourselves and in our world. So... while this year is our "shakedown" cruise, time to learn the boat and how to get along on it, next year we can start making the connections to the folks who will fill out our Technomadic Flotilla of Dramanauts. Need some more inspiration? Here are some other folks who found a way to merge art and boating in one way or another. I am sure there are many more too! Miss Rockaway Armada a crazy bunch artists with a similar dream who floated down the Mississippi creating art and theatre along the way. Caravan Stage large scale theatrical production from an amazing vessel. 1000 Days at Sea this project isn't exactly a community, but a couple merging, life, art, sailing and spirit. Some inspired blogging too! And my favorite, a group that sprang from the hearts and minds of the most wonderful, Poppa Neutrino and Captain Betsy. The Floating Neutrinos. I've added a link to Nomadness and Dramanauts from my blog! V. supportive of your approach.